"The 3.7 inch Mark II was the standard British heavy anti-aircraft (AA) gun of the Second World War. It was effective against enemy bombers up to 32,000 feet (9,800 metres), and could be fired at a rate of eight rounds per minute. In July 1940 Portsmouth's defences included sixteen 3.7 inch guns, as well as sixteen 4.5 inch and four 3 inch. This anti-aircraft gun was recovered from a scrapyard in Eire in 1972. 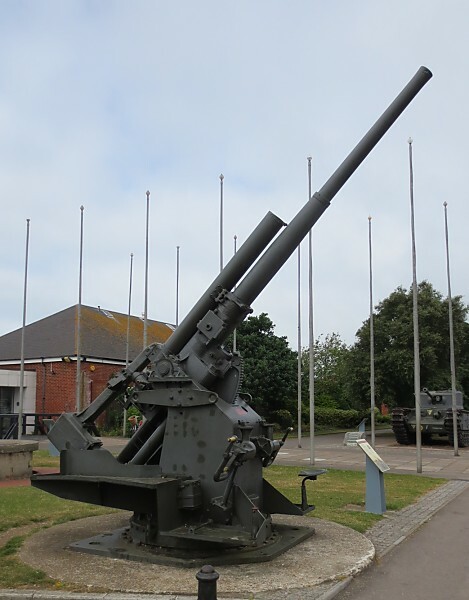 It was restored for Portsmouth Museums Service by former serving members of the 214th (Southsea) AA Battery of the 57th (Wessex) Heavy AA Regiment, Royal Artillery (Territorial Army), who spent a total of 474 hours working on the project. On the front of the gun is the 'flaming Dornier' sign of the 57th (Wessex) Heavy AA Regiment, which was responsible for manning the anti-aircraft defences of Portsmouth and the Isle of Wight 1939-1941. During the Blitz on Portsmouth, the Regiment's four batteries fired more than 125,000 rounds"